TB Joshua's Michael Jackson, Mutharika Prophesy, And His Prophesied Life. TB Joshua’s Michael Jackson, Mutharika Prophesy, And His Prophesied Life. Who Is This Man TB Joshua.. When the Africa heard of Malawi’s president cardiac arrest , and his death a day later, one word came haunting, TB Joshua. Less than two months ago, the Nigerian prophet told his congregation that God had showed him the death of an old African president. Since he had already built a reputation by accurately prophesying the death of pop icon Michael Jackson, the world did not take those words lightly. Immediately, social networking sites were on fire as to who, TB Joshua was referring to. High on the list of possible candidates was, Zimbabwe’s Robert Mugabe, Kenya’s Mwai Kibaki, Malawi’s Bingu wa Mutharika and Senegal’s Abdoulaye Wade, who has since lost the election. This was going by the words of TB Joshua that the president is old. This weekend, just one week before the death of Bingu wa Mutharika, TB Joshua repeated his calls that Africa prays for its leaders as the death of one of its president was very close. Social networks were reignited again. 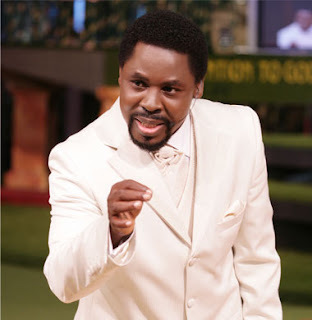 Temitope Balogun Joshua was born in 1963 in Nigeria and is the leader and founder of the organization, The Synagogue, Church of All Nations (SCOAN), which runs its own TV station, Emmanuel TV. As with many successful church ministers, TB Joshua as been a target of controversies. Some pastors have even accused him of using other powers other than God’s. That statement immediately solidified TB Joshua’s prophesying credentials. That was however not the only TB Joshua’s prophesy that has come to pass. He is said to have predicted several football match outcomes, including the final of AFCON, where Zambia’s Chipolopolo carried the day. “I was attending to people in my office one day when three journalists entered; the three of them came from three different media houses. They asked, “Prophet Sir, we see and know you to be one of foremost Prophets of God in Africa today. Millions of people are looking forward to your comments because you are the only prophet who has never commented on the subject?” At this point, before they mentioned what they really wanted and the man in question, our Lord Jesus Christ appeared to me from the Altar in my office on a golden, very beautiful and mighty chair. He commanded me not to join fake, jealous and envious prophets to say blasphemy against a fellow messenger of God. ‘The Man in the Synagogue is mine. He is your spiritual colleague. He is not fake. His power is not mixed. I do as I please. You are all working for my glory on earth. Do never disown or desert him. Truly he is young in age, but my spirit in him is pure and great. His grace is special. Many will fall through him, while others will rise through him also. Advise him always like a son, friend and colleague and do not judge him at all because God is the only judge. I reveal this to you because you fear, adore and do my wish always. I love you’ – and He disappeared. I then turned and faced the three men again. And I started telling them all God told me about the man, Temitope Joshua, in the Synagogue, Egbe, Lagos. They were marvelled and become embarrassed. Then one of them said, “Daddy, we believe you, but we want you to see him conjure with his hand. He is using mixed powers. Two other top prophets and the head of witches have promised to test and punish him.” I told them that all the witches and prophets on earth cannot even face an anointed man of God. I even warned them not to join the unbelievers that are fighting God through his prophets. After that they left”. “a young man from Nigeria would be highly anointed, such that all the nations of the world would embrace the mighty God through him.” He said a time would come that the Synagogue Church of All Nations will become a Jerusalem in Nigeria, such that the number of foreigners would outnumber the Nigerians attending the church. Balotelli Involved In Another Car Crash. Video Of GSU Officers Beating Turkana Man.